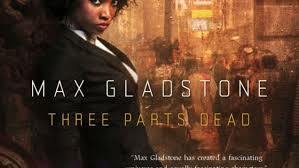 Today in my increasingly off-deadline daily blogging project, I’d like to shill for Three Parts Dead, a book that lies somewhere in the middle of Max Gladstone’s The Craft Sequence series. If I sound a bit ambiguous about where a book with the word “three” in the title might fit in a five-book series, it’s because they were written out of order. You can get the details in this I09 article, though don’t read too far past the first couple of paragraphs if you want to avoid series spoilers. Irrespective of its place in a larger narrative, Three Parts Dead is a terrific fantasy story, a murder mystery where a team of necromancers is trying to discover who killed the patron god of a city. There are implacable drone police, vampire sea captains, fire priests, gargoyles and the aforementioned practitioners of the Craft (essentially necromancy) charged with working out whodunnit. I finished reading this one last night and would have leapt straight into the rest of the series if I’d had them available (and if I didn’t have a to-be-read pile that would make the Library of Alexandria look a bit pov). Highly entertaining fare, with cool magic, well-developed characters, and some delicious action scenes. Oh, and a gorgeous Chris McGrath cover as an added bonus. This entry was posted in Relentless positivity and tagged chris mcgrath, max gladstone, the craft sequence, three parts dead. Bookmark the permalink. I’ve had this sitting on Mt TBR since the Hugos. Maybe I need to bump it up the list. I think it was in my queue for even longer than that. I’m pretty sure I bumped it up the list because Max Gladstone said something funny and/or clever on Twitter.